Hi there! Welcome to day two of the December Papertrey Ink countdown. These scribbled florals can be colored in and even accented with the included leaves. Tuck the "With Love" sentiment into the frame, mix and match with other Splits sets, or use a sentiment from another set for more options. For this one-layer wonder I inked up this sweet frame in three colors... summer sunrise, scarlet jewel, and plum pudding. The leaves were added using the color simply chartreuse. 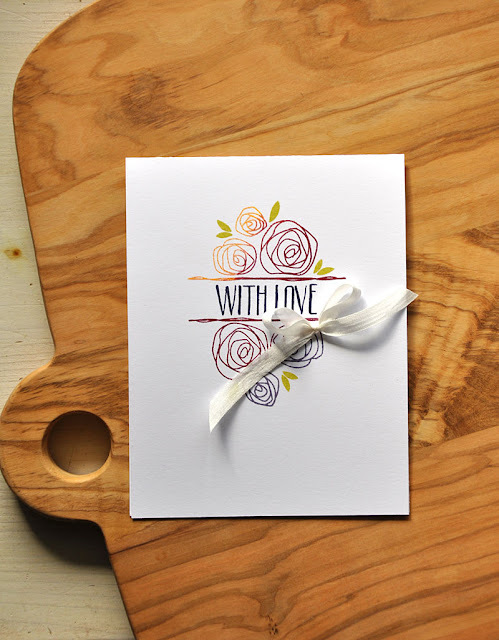 A small silky bow is the perfect touch to give this simple card a little something extra, I easily formed the bow and attached it with a touch of adhesive. Well, there's a quick look from me at the latest from my Stamping Simply lineup. Just remember... everything showcased today will be available for purchase through Papertrey Ink, beginning December 15th. I love the beautiful simplicity of your card! CAS - just love it! Very nice card with its simplicity! You at your best. You're truly one of a kind. 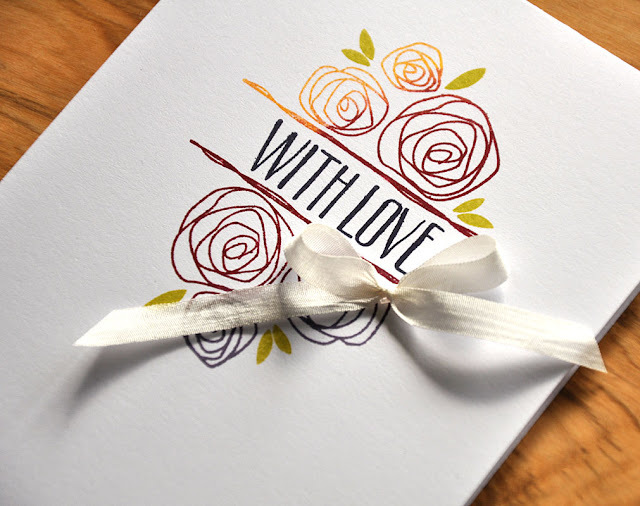 I love the way you stamped this card in all different colors of ink. The stamp is so simple and beautiful.